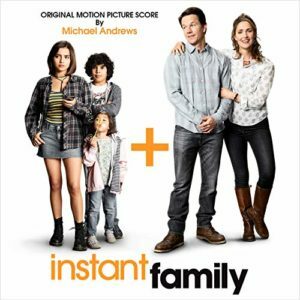 Sean Anders’ “dramedy” Instant Family (2018), about a couple trying to adopt three young kids, came and went without much notice. And it’s completely understandable, because it’s an instantly forgettable affair (if you’ll excuse the pun). Trite, predictable and overwrought, there is nothing in the couple (played rather vacously by Mark Wahlberg and Rose Byrne), nor the three kids that warrant much in terms of credibility or emotional investment. However, sometimes bad films get excellent scores, and that is most certainly the case here. Michael Andrews (born 1967) is a multi-instrumentalist who frequently dabbles in experimental pop and electronic music. He’s probably still most famous for his score to cult classic Donnie Darko (2000), but since then the film score career has never quite taken off, with the possible exception of Me and You and Everyone We Know (2005) and Bridesmaids (2011). It’s not that he doesn’t get assignments; it’s more that he’s been typecast in bad (or at best mediocre) comedies like The Heat (2013), Dirty Grandpa (2016) or The Big Sick (2017). Fortunately, the quality of his music often transcends the material it’s written for, Instant Family being such an instance. Although the film is very much contemporary in its setting, Michael Andrews’ score has a very retrospective, 80s quality in its airy, light synth landscapes – perhaps intended as a nostalgic device to mirror the 40-something couple and their longing for a family of their own. Several of the cues are driven by guitars, sit com-like keyboard chords and brief, “woodblocky” percussion samples, like «Orientation» or «Gonna Have Kids». But at the center of the score is a gorgeous, expansive ‘family theme’ that bears a striking resemblance to the sound and instrumentation of Elton John’s «Sacrifice» – like the 4-minute highlight track «Stuck WITH Us», or in «Instant Family» and «Crazy Life Decision» (I would not be surprised if «Sacrifice» was used in the temp track). Yet other parts feel a tad more contemporary, like the more whimsical indiepop flavour of «Lizzie’s Theme» or «Whan and Wharry». There are definite shades of Jan Hammer’s 80s work in this score, and several of the tracks in the 37-minute album could easily have been taken from one of his more reflective Miami Vice episodes. Since the score is mixed relatively low in the film, it gets to shine on album as its own entity – separated from the less-than-stellar film. If this score proves anything, it’s that Michael Andrews is still very much a creative and flourishing composer, even if few people have heard his name since Donnie Darko. While we’re waiting for him to get better and more diverse assignments, preferably not just comedies, it’s somehow comforting to know that he’s able to compose wonderful scores for films that don’t really deserve his talent.